Rozalind Jester, Ph.D. a.k.a. "Dr. Roz"
I consider myself one of the lucky ones because I believe I have found my true calling working in higher education! As a west coast native and a life long ocean lover, I followed my dream to pursue a career in ocean science. Currently, I am a full-time faculty member at Florida SouthWestern State College (FSW) in Fort Myers, Florida where I teach introductory level marine science to primarily non-science majors. It is my mission to try to inspire my students to become ocean crusaders and I am committed to providing them with memorable, hands-on experiences in the field & in the classroom, whether they take my online or the more traditional on-campus course. Before I started teaching at FSW (formerly Edison State College), I lived in Santa Cruz, CA where I studied as a National Science Foundation Fellow at the University of California, Santa Cruz (UCSC). 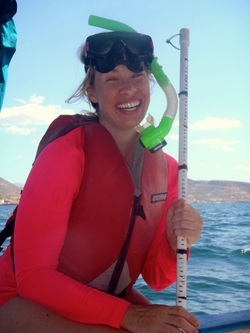 In 2008, after six years of graduate school I finally earned my doctorate in Ocean Science (it felt like an eternity, but in hind sight it flew by!). I grew up in southern California and have always been a "water-baby", but I truly fell in love with the power, mystery & intrigue of the ocean during my 10 years in Santa Cruz. While I was there, I completed research on the food-web ecology of toxin producing algae (more commonly known around these parts as “red tide”) and specifically those organisms responsible for human seafood poisoning events along the west coast of North America. What this means is that my experience is more on the "biological" end of the oceanography spectrum. Though I loved doing research, I decided that I wanted to pursue a career in teaching... and specifically teaching at the introductory "community college" level. I was a community college student way back when (I earned my AA in Liberal Arts in 1999) and it changed the path of my life. I owe a debt of gratitude to the inspiring professors I had at Oxnard College, because that is when I discovered how much I LOVE learning... and, surprisingly at the time, that I was great at it! I'd like to give that experience back and I also think it is incredibly important in today's day and age that we all have a basic understanding of the marine environment - it IS undoubtedly the lifeblood of this planet, without a functioning ocean our lives would be very very different - or non-existent. By sharing my love of marine biology and passion for ocean conservation I hope to instill a sense of inquiry and social responsibility in my students. In my down time, I love to travel and am always up for a trip to the beach of course!